instructs students on the finer points of machinegun handling. IN THE desert near Las Vegas, a former chiropractor is spending $25 million (£15 million) on a holiday destination with a difference - a resort based on one of the world's largest non-military shooting ranges. "We've designed it to rival any high-end golf course you can think of, but with firearms training that exceeds what law enforcement officers get," Ignatius Piazza said yesterday as bulldozers worked on 12 separate firing ranges at his chosen site about 60 miles southwest of America's gambling capital. An underground attraction called "Tunnels of Terror" is also taking shape. The first phase of Dr. Piazza's 550-acre project is due to open in October. An airstrip and "celebrity firing range" are to be finished this time next year and a planned residential community with its own private school should be completed by 2001. But the scheme has already made headlines thanks to Dr. Piazza's trenchant public stance against gun control since the Littleton school shootings in Colorado. "It comes down to how many times [officials] are willing to have these tragedies occur before doing something pro-active and responsible," he said. Like Charlton Heston, the chairman of the National Rifle Association, Dr. Piazza has advocated arming America's school security guards. He has also offered them free firearms training. With new gun control measures on the fast track to becoming law in Washington, the rhetoric and antics of the nation's gun-lovers have taken on the tone of a crusade. Full-page NRA advertisements appear frequently in the national press calling for a redoubled grassroots defence of the constitutional right to bear arms. And for Dr. Piazza, diminutive and soft-spoken behind a bushy moustache, business is brisk. He claims to have enrolled 3,000 new students this year alone at a training facility that he has run in California since 1986. 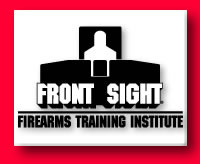 Here, an intensive residential course towards becoming a "Four-Weapons Combat Master" expert in the use of handguns, shotguns, rifles and machineguns, costs $2,000. It is taught by Dr. Piazza himself. 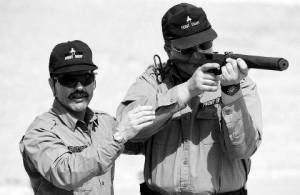 A four-day "defensive handgun" course costs $900 and is offered as the answer to many of the ills of US society. "If everyone in the country attended it, the US would be the safest country in the world," Dr. Piazza said. In the meantime, visitors to his Nevada building site are being offered a powerful incentive to come back when the resort is finished: free introductory machinegun courses at weekends.